for a faster semi homemade pancake see, "Perfection Pancakes." Place a sieve over a large bowl and sift together the flour, sugar, and salt. In a large bowl, stir together the yogurt and baking soda; let sit for 10 minutes. Add the yogurt mixture, seltzer, and eggs to the flour mixture and whisk until just combined. Let batter rest. Heat 1 tbsp. butter in a 12" nonstick skillet over medium heat. Working in batches, spoon about 1⁄4 cup into skillet, gently spreading out each portion of batter with the bottom of a spoon or a measuring cup to make disks about 4 1⁄2" in diameter. Cook pancakes until bubbles begin to form around edges, about 2 minutes. 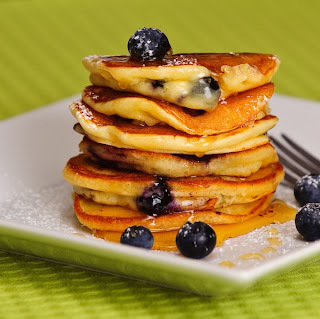 Top each pancake with blueberries, press down on them gently with a spoon, flip each pancake with a spatula, and cook until golden brown, about 2 minutes more. Just Like Red Lobster Biscuits!! !